After months of planning and preparation a new Acaster Lane shop has opened its doors. 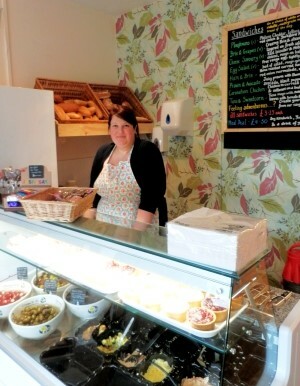 Delicacy is a delicatessen and sandwich bar, serving fine Yorkshire produce. Owner Jen Auton is well known for her own home made cakes, which will be available in the shop, alongside artisan breads, cooked meats, specialist pies, cheeses, olives, and much more. Lunchtime salad boxes and sandwiches have already been a big hit in the run up to Saturdays official opening, and with a couple of tables where customers can relax with a coffee and a bite it looks like Jen has found something that will appeal to both locals and those from farther afield. Bishopthorpe dot net is pleased to see any new business open in the village, and with the quality and taste that Delicacy offers it’s certainly a business that deserves to succeed. So this is another great reason to shop in the village rather than go off to the surrounding megastores. Try something local – and check out the other shops too!